For the journal, see Asian Culture (journal). As the largest, most populous continent and rich in resources, Asia is home to several of the world's oldest civilizations, that produced the majority of the great religious systems, the oldest known recorded myths and codices on ethics and morality. However, Asia's enormous size separates the various civilizations by great distances and hostile environments, such as deserts and mountain ranges. Yet by challenging and overcoming these distances, trade and commerce gradually developed a truly universal, Pan-Asian character. Inter-regional trade was the driving and cohesive force, by which cultural elements and ideas spread to the various sub-regions via the vast road network and the many sea routes. Asia's various modern cultural and religious spheres correspond roughly with the principal centres of civilisation. West Asia and Central Asia have their cultural roots in the pioneering civilisations of the Fertile Crescent and Mesopotamia. South Asia, India and the Indosphere emanate from the Indus Valley Civilisation. The East Asian cultural sphere developed from the Yellow River civilization. Southeast Asia's migration waves of more varied ethnic groups are relatively recent. Commercial interaction with South Asia eventually lead to the adoption of essential cultural elements from India and to a lesser extent from China. North Asia's harsh climate and unfavorable soil proved to be unsuited to permanently support large urban settlements and only permits the presence of a pastoral and nomadic population, spread over large areas. Nonetheless, North Asian religious and spiritual traditions eventually diffused into more comprehensive systems such as Tibetan Buddhism that developed its own unique characteristics (e.g. Mongolian Buddhism). The term East Asia defines the geographical region and/or the common cultural sphere of China, Japan, North Korea, South Korea, Taiwan and, variously Vietnam and Mongolia. Ethnically and linguistically very closely related, shared artistic traditions, written language and moral values suggest that most East Asian peoples are descendants of the Yellow River civilization, that emerged in the flood plains of northern China around 10.000 years B.P. China has occupied the prominent, central role in East Asia for most of recorded history, as it "deeply influenced the culture of the peripheral countries and also drew them into a China-centered [...] international order", that virtually remained in effect until the early 20th century. Highly ritualized, the Imperial Chinese Tributary System, based on the religious and philosophical idea of submission to celestial harmony was also recognized by nations beyond, in Southeast Asia in particular. Ceremonies were presided over by the Emperor of China as the Son of Heaven and curator of the Mandate of Heaven. In elaborate ceremonies both, the tributary state and the various Chinese dynasties agreed to mutually favorable economic co-operation and beneficial security policies. Defining East Asian cultural characteristics are the Chinese language influences and traditional writings systems, as well as shared religious and ethic ideas, that are represented by the Three teachings Buddhism, Taoism and Confucianism. The Chinese script is one of the oldest continuously used writing systems in the world, and has been a major unifying force and medium for conveying Chinese culture in East Asia. Historically used throughout the region and it is still in use by ethnic Chinese throughout the world, as well as in Japan and to a small and waning extent in South Korea. However, as Chinese writing concepts were passed on to Korea, Japan and Vietnam, these nations developed their own characteristic writing systems as the cultural expression of their language families, such as Vietnamese, an Austro-Asiatic language; Japanese, a Japonic language; and Korean, a Koreanic language. Whereas Chinese is still found in the historical roots of many borrowed words, modern Chinese has been influenced by other Asian languages, such as by modern technical and political terms created in Japan to represent western concepts known as Wasei-kango. Apart from the unifying influence of Confucianism, Taoism, Chinese characters and numerous other Chinese cultural influences, East Asian national customs, architecture, literature, cuisines, traditional music, performing arts and crafts also have developed from many independent and local concepts, they have grown and diversified as many rank among the most refined expressions of aesthetic, artistic and philosophical ideas in the world. Notable among others are Japanese gardens and landscape planning, Heian literature, Vietnamese Water puppetry and the artifacts of the Dong Son culture. 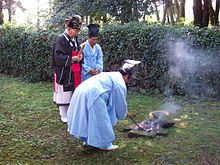 Modern research has also focused on the several nations pivotal role on the collective body of East Asian Buddhism and the Korean influence on Japanese culture. Constricted for a long time by ethnic nationalism and antagonism, the nature of mutual cultural interchange in East Asia is only partly known. Evidence of Neolithic culture has been found throughout the modern states Afghanistan, Bangladesh, Bhutan, Maldives, Nepal, India, Pakistan and Sri Lanka that represent South Asia or Southern Asia (also known as the Indian subcontinent). Since 3,300 B.C. in modern-day northeastern Afghanistan, in Pakistan and northwestern India a sophisticated Bronze Age cultural tradition emerged, that after only a few centuries fully flourished in urban centers. Due to the high quality of its arts, crafts, metallurgy and buildings, the accomplishments in urban planning, governance, trade and technology etc. it has been classified as one of the principal Cradles of civilization. Referred to as the Indus Valley Civilisation or Harappan Civilisation it thrived for almost 2.000 years until the onset of the Vedic period (c. 1500 – c. 600 B.C.). The great significance of the Vedic texts (that don't mention cities or urban life) for South Asian culture, their impact on family, societal organisation, religion, morale, literature etc. has never been contested. The Indus Valley Civilisation on the other hand has only come to light by means of 20th century archaeology. Scholars, who employ several periodization models argue over whether South Asian tradition is consciously committed to the Harappan culture. Declining climatic conditions, (aridification) and population displacement (Indo-Aryan migration) are regarded as to have caused the fatal disruption of the Harappa culture, that was superseded by the rural Vedic culture. Following the Indo-Aryan settlement in the Indo-Gangetic Plain and the establishment of the characteristic social groups (Brahmanas, Kshatriyas, Vaishyas and Shudras) in the caste system based on the Jāti model in the Varna order, the tribal entities variously consolidated into oligarchic chiefdoms or kingdoms (the 16 Mahajanapadas), beginning in the sixth century B.C. The late Vedic political progress results in urbanization, strict social hierarchy, commercial and military rivalries among the settlers, that have spread all over the entire sub-continent. The large body of Vedic texts and literature, supported by the archaeological sequence allows researchers to reconstruct a rather accurate and detailed image of the Vedic culture and political organisation. The Vedas constitute the oldest work of Sanskrit literature and form the basis of religious, ethic and philosophic ideas in South Asia. They are widely, but not exclusively regarded the basics and scriptural authority on worship, rituals, ceremonies, sacrifices, meditation, philosophy and spiritual knowledge for the future Hindu and Buddhist cosmology. Commentaries and discussions also focus on the development of valid political ideas and concepts of societal progress and ethic conformity. Hinduism, Buddhism, Jainism and Sikhism are major world religions that originate in South Asia. These arguably represent the furthest reaching, most profound and permanent South Asian ideas on other cultural spheres. After a long and complex history of cosmological and religious development, adoption and decline, the Hindu-synthesis and the late but thorough introduction of Islam about 80% of modern day Indians and Nepalis identify as Hindus. In Sri Lanka and Bhutan most people adhere to various forms of Buddhism. Islam is the predominant religion in Afghanistan, the Maldives (99%), Pakistan (96%) and Bangladesh (90%). Afghanistan and Pakistan are situated at the western periphery of South Asia, where the cultural character has been made by both, Persia, a civilization rooted in Mesopotamia and the Indosphere. Pakistan is split with its two western regions of Baluchistan and Khyber Pakhtunkhwa sharing a greater Iranic heritage due to the native Pashtuns and Baloch people of the regions. Its two eastern regions of Punjab and Sindh share cultural links to Northwest India. Bangladesh and the Indian state of West Bengal share a common heritage and culture based on the Bengali language. The Culture of India is diverse and a complex mixture of many influences. Nepal is culturally linked to both India and Tibet and the varied ethnic groups of the country share many of the festivals and cultural traditions used and celebrated in North and East India and Tibet. Nepali, the dominant language of Nepal uses the Devanagari alphabet which is also used to write many North Indian languages. Bhutan is a culturally linked to Tibet with significant influences from India. Tibetan Buddhism is the dominant religion in Bhutan and the Tibetan alphabet is used to write Dzongkha, the dominant language of Bhutan. There is a cultural and linguistic divide between North and South India. Sri Lanka is culturally tied to both India and Southeast Asia. Sinhala, the dominant language in the country is written in Sinhala script which is derived from the Kadamba-Pallava alphabet, certain cultural traditions, and aspects of its cuisine, for example, show South Indian influences. Cultural festivals, aspects of its cuisine and Theravada Buddhism, the dominant religion in Sri Lanka, show a Southeast Asian affinity. Indo-Aryan languages are spoken in Pakistan, Bangladesh, Sinhala of Sri Lanka and most of North, West and East India and Nepal. Dravidian languages are spoken in South India and in Sri Lanka by the Tamil community. Tibeto-Burman languages are spoken in the North and North East India. Iranic Languages are spoken in Baluchistan and Khyber Pakhtunkhwa in Pakistan. The main languages of Afghanistan are Pashto and Dari. Southeast Asia divides into Mainland Southeast Asia, that encompasses Vietnam, Laos, Cambodia, Thailand, Myanmar and West Malaysia, and Maritime Southeast Asia, that includes Indonesia, East Malaysia, Singapore, the Philippines, East Timor, Brunei, Cocos (Keeling) Islands, and Christmas Island. At the crossroads of the Indian and East Asian maritime trade routes since around 500 B.C., the region has been greatly influenced by the culture of India and China. The term Indianised Kingdoms is a designation for numerous Southeast Asian political units, that had to a varying degree adopted most aspects of India's statecraft, administration, art, epigraphy, writing and architecture. The religions Hinduism, Buddhism and Islam gradually diffused into local cosmology. 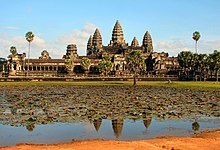 Nonetheless, the Southeast Asian nations have very diversely adapted to these cultural stimuli and evolved their distinct sophisticated expression in lifestyle, the visual arts and most notably in architectural accomplishments, such as Angkor Wat in Cambodia and Borobudur in Indonesia. 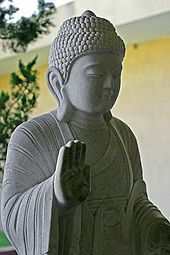 Buddhist culture has a lasting and significant impact in mainland Southeast Asia (Burma, Thailand, Laos, Cambodia and Vietnam); most Buddhists in Indochina practice Theravada Buddhism. In the case of Vietnam, it is also influenced much by Confucianism and the culture of China. Myanmar has also been exposed to Indian cultural influences. Before the 14th century, Hinduism and Buddhism were the dominant religions of Southeast Asia. Thereafter, Islam became dominant in Indonesia, Malaysia and Brunei. Southeast Asia has also had a lot of Western influence due to the lasting legacy of colonialism. One example is the Philippines which has been heavily influenced by the United States and Spain, with Christianity (Catholicism) as the dominant religion. East Timor also demonstrates Portuguese influence through colonialism, as is also a predominantly Christian nation. A common feature found around the region are stilt houses. These houses are elevated on stilts so that water can easily pass below them in case of a flood. Another shared feature is rice paddy agriculture, which originated in Southeast Asia thousands of years ago. Dance drama is also a very important feature of the culture, utilizing movements of the hands and feet perfected over thousands of years. Furthermore, the arts and literature of Southeast Asia is very distinctive as some have been influenced by Indian, Hindu, Chinese, Buddhist, and Islamic literature. Western Asia must be distinguished from the Middle East, a more recent Eurocentric term, that also includes parts of Northern Africa. West Asia consists of Turkey, Syria, Georgia, Armenia, Cyprus, Azerbaijan, Iraq, Iran, Lebanon, Jordan, Israel, Palestinian territories, Saudi Arabia, Kuwait, Bahrain, Qatar, United Arab Emirates, Oman and Yemen. The Israelite/Jewish civilization of the Fertile Crescent would have a profound impact on the rest of Western Asia, giving birth to the 3 Abrahamic faiths. In addition, the Jewish origins of Christianity, along with the many cultural contributions from both Jews and Arabs in Europe, meant that West Asian culture had left a lasting impact on Western civilization as well. Other indigenous West Asian religions include Zoroastrianism, Yazidism, Alevism, Druze and the Bahá'í Faith. Today, almost 93% of Western Asia's inhabitants are Muslims and is characterized by political Islamic, with the exception of Israel, a Jewish state. At its north-western end, Armenia and Georgia have an unmistakable Christian tradition, while Lebanon shares a large Christian and a large Muslim community. Ethnically, the region is dominated by Arab, Persian, Kurdish, Azerbaijani, and Turkish people. Among them smaller indigenous groups are the Jews, Assyrians, Druze, Samaritans, Yazidis and Mandeans. Many Middle Eastern countries encompass huge deserts where nomadic people live to this day. In great contrast, modern cities like Abu Dhabi, Amman, Riyadh, Tel Aviv, Doha and Muscat have developed on the coastal lands of the Mediterranean Sea, the Persian Gulf and at the periphery of the Arabian Desert. West Asian cuisine is immensely rich and diverse. The literature is also immensely rich with Arabic, Jewish, Persian, and Turkish dominating. Central Asia, in between the Caspian Sea and China, envelops five former Soviet Socialist Republics: Kazakhstan, Kyrgyzstan, Tajikistan, Uzbekistan and Turkmenistan. However, Afghanistan is sometimes included. Its strategic and historic position around the East-West axis and the major trading routes guaranteed a steady influx of ideas and conflicting notions of tribalism and traditionalism. However, the region was conquered and dominated by a variety of cultures, such as the Mongols, Persians, Tatars, Russians, Sarmatians. As some Central Asian areas have been inhabited by nomadic people, numerous urban centers have developed in a distinct local character. For the most part, North Asia (more widely known as Siberia) is considered to be made up of the Asian part of Russia solely. The geographic region of Siberia was the historical land of the Tatars in the Siberia Khanate. However Russian expansion essentially undermined this and thus today it is under Russian rule. There are roughly 40 million people living in North Asia and the majority consists now of Ethnic Russians. Asia is home to countless grandiose and iconic historic constructions, usually religious structures, castles and fortifications or palaces. However, after several millennia, many of the greatest buildings have been destroyed or dismantled such as the Ziggurats of Mesopotamia, most of the Great Wall of China, Greek and Hellenistic temples or the royal cities of Persia. Chinese architecture has taken shape in East Asia over many centuries as the structural principles have remained largely unchanged, the main changes being only the decorative details. An important feature in Chinese architecture is its emphasis on articulation and bilateral symmetry, which signifies balance. Bilateral symmetry and the articulation of buildings are found everywhere in China, from palace complexes to humble farmhouses. Since the Tang dynasty, Chinese architecture has had a major influence on the architectural styles of Korea, Vietnam, and Japan. Indian architecture is that vast tapestry of production of the Indian Subcontinent that encompasses a multitude of expressions over space and time, transformed by the forces of history considered unique to the sub-continent, sometimes destroying, but most of the time absorbing.The result is an evolving range of architectural production that nonetheless retains a certain amount of continuity across history. The Indonesian architectute reflects the diversity of cultural, historical and geographic influences that have shaped Indonesia as a whole. It ranges from native vernacular architecture, Hindu-Buddhist temples, colonial architecture, to modern architecture. Indonesian vernacular architecture is called rumah adat. The houses hold social significance in society and demonstrate local ingenuity in their relations to environment and spatial organisation. :5 Notable examples include Rumah Gadang, Tongkonan, Balinese houses and Javanese Joglo. 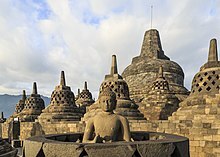 Hindu-Buddhist temple monument called candi, with the best example are Borobudur massive stone mandala-stupa and Prambanan Hindu temple dedicated to Trimurti gods. By the 16th century, the Portuguese followed by the Dutch colonize Indonesian archipelago, and developed European architecture technique and developed colonial architecture. Japanese architecture is distinctive in that it reflects a deep ″understanding of the natural world as a source of spiritual insight and an instructive mirror of human emotion″. Attention to aesthetics and the surroundings is given, natural materials are preferred and artifice is generally being avoided. Impressive wooden castles and temples, some of them 2000 years old, stand embedded in the natural contours of the local topography. Notable examples include the Hōryū Temple complex (6th century), Himeji Castle (14th century), Hikone Castle (17th century) and Osaka Castle. 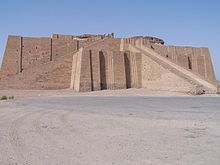 The ancient architecture of the region of the Tigris–Euphrates river system dates back to the 10th millennium BC and lead to the development of urban planning, the courtyard house, and ziggurats. The basic and dominant building material was the mudbrick, which is still in use in the region for the construction of residential structures. Kiln-burnt bricks were coated with a vitreous enamel for purposes of decoration and bitumen functioned as cement. Palaces or temples were constructed on terraces as rooms usually grouped round quadrangles, with large doorways and the roofs rested on richly ornamented columns. Middle Eastern dance has various styles and has spread to the West in the form known as bellydancing. In the Punjab region of India and Pakistan, Bhangra (dance)bhangra dance is very popular. The bhangra is a celebration of the harvest. The people dance to the beat of a drum while singing and dancing. In Southeast Asia, dance is an integral part of the culture; the styles of dance vary from region to region and island to island. Traditional styles of dance have evolved in Thailand and Burma. The Philippines have their own styles of dance such as Cariñosa and Tinikling; during the Spanish occupation of the Philippines, practitioners of Filipino martial arts hid fighting movements into their dances to keep the art alive despite the fact that it was banned by the occupiers. Martial arts figure prominently in many Asian cultures, and the first known traces of martial arts date from the Xia Dynasty of ancient China from over 4000 years ago. Some of the best known styles of martial arts in the world were developed in East Asia, such as karate and judo from Japan, taekwondo from Korea and the various styles of Chinese martial arts known collectively as kung fu. Many other styles of martial arts originated in Southeast Asia, including muay Thai from Thailand, Vovinam from Vietnam, Arnis from the Philippines, and Pencak Silat from Indonesia. In addition, popular styles of wrestling have originated in Turkey and Mongolia. Development of Asian martial arts continues today as newer styles are created. Modern hybrid martial arts systems such as Jeet Kune Do and Krav Maga often incorporate techniques from traditional East Asian martial arts. Asian martial arts are highly popular in the Western world and many have become international sports. Karate alone has 50 million practitioners worldwide. Arabic literature is the writing, both prose and poetry, produced by writers in the Arabic language. One of the most famous literary works of West Asia is One Thousand and One Arabian Nights. Jewish literature consists of ancient, medieval, and modern writings by Jews, both in their original homeland and in the diaspora. A sizable amount of it is written in the Hebrew language, although there have been cases of literature written in Hebrew by non-Jews. Without doubt, the most important such work is the Hebrew Bible (Tanakh). Many other ancient works of Hebrew literature survive, including religious and philosophical works, historical records, and works of fiction. The famous poet and playwright Kālidāsa wrote two epics: Raghuvamsham (Dynasty of Raghu) and Kumarasambhavam (Birth of Kumar Kartikeya); they were written in Classical Sanskrit rather than Epic Sanskrit some other examples of his plays are Abhigyanam Shakuntala . Other examples of works written in Classical Sanskrit include the Pānini's Ashtadhyayi which standardized the grammar and phonetics of Classical Sanskrit. The Laws of Manu is an important text in Hinduism. Kālidāsa is often considered to be the greatest playwright in Sanskrit literature, and one of the greatest poets in Sanskrit literature, whose Recognition of Shakuntala and Meghaduuta are the most famous Sanskrit plays. He occupies the same position in Sanskrit literature that Shakespeare occupies in English literature. Some other famous plays were Mricchakatika by Shudraka, Svapna Vasavadattam by Bhasa, and Ratnavali by Sri Harsha. Later poetic works include Geeta Govinda by Jayadeva. Some other famous works are Chanakya's Arthashastra and Vatsyayana's Kamasutra. Korean literature begins in the Three Kingdoms Period, and continues through the Goryeo and Joseon dynasties to the modern day. Examples of Korean poetric forms include sijo and gasa, with Jeong Cheol and Yun Seon-do considered to be the supreme Korean poets. Examples of renowned Korean prose masterpieces include the Memoirs of Lady Hyegyeong, The Cloud Dream of the Nine and the Chunhyangjeon. Pakistani literature has a rich history, and draws influences from both Persian, Muslim and Indian literary traditions. The country has produced a large number of famed poets especially in the national Urdu language. The famous Muhammad Iqbal, regarded as the national poet, was often called "The Poet of the East" (Shair-e-Mashriq). The polymath Rabindranath Tagore, a Bengali poet, dramatist, and writer from India, became in 1913 the first Asian Nobel laureate. He won his Nobel Prize in Literature for notable impact his prose works and poetic thought had on English, French, and other national literature of Europe and the Americas. He also wrote Jana Gana Mana the national anthem of India as well as Amar Sonar Bangla the national anthem of Bangladesh. Moreover, translation of his another song “Namo Namo Matha" is the national anthem of Sri Lanka. This song was collected by his student Mr. Ananda Samarakoon and M. Nallathamby translated in Tamil language. Other Asian writers won Nobel Prizes in literature, including Yasunari Kawabata (Japan, 1966), and Kenzaburō Ōe (Japan, 1994). Yasunari Kawabata wrote novels and short stories distinguished by their elegant and spartan diction such as the novels Snow Country and The Master of Go. Families in Asia has a very strong family value. They teach their kids that the family is their protection and the major source of their identity. They expect loyalty from their children. Parents define the law and the children are expected to obey them. This is called filial piety, the respect for one's parents and elders. They are expected to have self-control, thus making it hard for them to express emotions, they are also expected to show respect through their motions and the way they speak. Children are expected to look after their parents when they grow older. Sons are expected to stay home, while daughters go and live with their husband's family. Asian philosophical traditions originated in India and China, and has been classified as Eastern philosophy covering a large spectrum of philosophical thoughts and writings, including those popular within India and China. The Indian philosophy include Jain philosophy, Hindu and Buddhist philosophies. They include elements of non-material pursuits, whereas another school of thought Cārvāka, which originated in India, and was propounded by Charvak around 2500 years before, preached the enjoyment of material world. Middle Eastern philosophy includes Islamic philosophy as well as Jewish and Persian philosophy. During the 20th century, in the two most populous countries of Asia, two dramatically different political philosophies took shape. Mahatma Gandhi gave a new meaning to Ahimsa, and redefined the concepts of nonviolence and nonresistance. During the same period, Mao Zedong's communist philosophy was crystallized. The Syriac Orthodox Saint Ahoadamah Church was a 7th-century church building in the city of Tikrit, one of the oldest in the world until its destruction by the Islamic State of Iraq and the Levant on 25 September 2014. 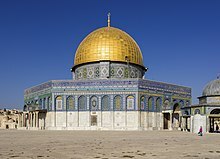 Dome of the Rock, an Islamic shrine in Jerusalem. Asia is the birthplace of many religions such as Buddhism, Christianity, Confucianism, Hinduism, Islam, Jainism, Judaism, Shintoism, Sikhism, Taoism, and Zoroastranism. All major religious traditions are practiced in the region and new forms are constantly emerging. The largest religions in Asia are Islam and Hinduism, both with approximately 1.1 billion adherents. In 2010, the Pew Research Center found five of the ten most religiously diverse regions in the world to be in Asia. Over 60% of the global Muslim population is in Asia. About 25% of Muslims live in the South Asian region, mainly in Pakistan, India, Bangladesh and the Maldives. If Afghanistan is counted, this number is even higher. The world's largest single Muslim community (within the bounds of one nation) is in Indonesia. There are also significant Muslim populations in the Philippines, Brunei, Malaysia, China, Russia, Central Asia and West Asia. In the Philippines and East Timor, Roman Catholicism is the predominant religion; it was introduced by the Spaniards and the Portuguese, respectively. In Russia, Georgia, and Armenia, Orthodox Christianity is the predominant religion. Eastern Christian sects are the most dominant denomination in Asia, having adherents in portions of the Middle East (the Levant) and South Asia. Eastern churches include Assyrian Church of the East, Syriac Orthodox Church, Maronite Church, Syriac Catholic Church, Chaldean Catholic Church and Syro-Malabar Catholic Church, among others. Judaism is the major religion of Israel. In Japan, Japanese New Year, National Foundation Day, Children's Day, O-bon, The Emperor's Birthday and Christmas are popular. According to Japanese syncretism, most Japanese celebrate Buddhism's O-bon in midsummer, Shinto's Shichi-Go-San in November, and Christmas and Hatsumoude in winter together. In India, Republic Day and Independence Day are important national festivals celebrated by people irrespective of faith. Major Hindu festivals of India include Diwali, Dussehra or Daserra, Holi, Makar Sankranti, Pongal, Mahashivratri, Ugadi, Navratri, Ramanavami, Baisakhi, Onam, Rathayatra, Ganesh Chaturthi and Krishna Janmaashtami. Islamic festivals such as Eid ul-Fitr and Eid ul-Adha, Sikh festivals such as Vaisakhi, and Christian festivals such as Christmas, are also celebrated in India. The Philippines is also tagged as the "Fiesta Country" because of its all-year-round celebrations nationwide. There is a very strong Spanish influence in their festivals, thus making the Philippines distinctively "Western", yet retaining its native Asian characteristics. Fiesta is the term used to refer to a festival. Most of these fiestas are celebrated in honor of a patron saint. To summarize it all, at least every city or municipality has a fiesta. Some prime examples include Sinulog from Cebu and Dinagyang of Iloilo. Other famous Philippine festivals include the MassKara Festival of Bacolod and Panagbenga Festival of Baguio. In Indonesia, the Independence Day and the birthday of Pancasila are important. This Muslim majority country also celebrates Islamic celebrations and festivals, such as Eid ul-Fitr, Eid ul-Adha, Mawlid, Islamic New Year, Ashura, Tabuik, and Tasyrik day. Due to the vastness of Asia, popularity of sports varies greatly across the continent. Association football is widely popular in Asia. Boxing, badminton, and table tennis are very popular in East Asia. Baseball is popular in Japan, South Korea, and Taiwan. Cricket is especially popular in India, Pakistan, Bangladesh, and Sri Lanka; and more recently, in Nepal and Afghanistan. In many parts of Asia, rice is a staple food, and it is mostly served steamed or as a porridge known as congee. China is the world largest producer and consumer of rice. While grain flatbread were consumed in the Middle East to the Indian subcontinent. Traditionally, many Asians eat using their bare hand; this is a common practice in Central, South, and West Asia. However, western cutlery such as spoons and forks are currently being used increasingly and have also become widely available. With the advent of western cutlery, it may be viewed as rude in these nations to eat using the bare hands in some public places. In Indonesia and the Philippines, people usually use western cutlery such as the spoon, fork, and knife. While in China, Japan, Taiwan, Korea, and Vietnam, people usually use chopsticks to eat traditional food, but the shape of chopsticks are different in these countries. For example, Chinese chopsticks are long and square; Vietnamese chopsticks are long, being thick at one end and then gradually getting thinner at the other end, and are made of wood or bamboo; Japanese chopsticks are rounder, short, and spiral, having been designed to eat bony fish easily; Taiwanese chopsticks are made of materials such as bamboo, wood, and metal; Korean chopsticks are short, flat, and made of metal. It is said that wood is rarer than metal on the Korean Peninsula and that metal chopsticks can prevent poisoning. Fresh raw fish cuisines, such as sushi and sashimi are very popular in East Asia (especially Japan). These raw fish dishes were influenced by two major cultures: Chinese and Japanese. In India, people often eat food with their hands, and many spices such as cardamom, cumin, and fennel seeds are used in every dish. Most spices originated within the Indian subcontinent. Durians are a common fruit in Southeast Asia, which, Alfred Russel Wallace, attested to its delicious flavor as worth the entire cost of his trip there. 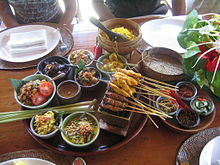 The cuisine of Indonesia possess rich and diverse collection of dishes and recipes with regional cooking tradition flourished, such as Minang Sundanese to Balinese. Most Indonesians consume steamed rice with flavorful meat, fish, and vegetables in one serving such as in Nasi Padang and nasi campur. Other notable example include rendang, satay, soto, and nasi goreng. In Filipino banquet, many unique dishes have arisen because of the country's long years of colonization and interactions with other neighboring cultures and nations; it has inherited Latin, Malay, Chinese, and American influences to its people's local blend. Chicken tikka, a well-known dish across the globe, reflects the amalgamation of South Asian cooking styles with those from Central Asia. ^ "Geographic Regions". United Nations. Retrieved 31 March 2018. ^ "Population". UNITED NATIONS. Retrieved 31 March 2018. ^ "Asia: Human Geography". National Geographic Society. Retrieved 31 March 2018. ^ Lockard, Craig A. (19 June 2014). Societies, Networks, and Transitions, Volume I: To 1500: A Global History. ISBN 9781285783086. Retrieved 31 March 2018. ^ Dominique Collon. "BBC - History - Ancient History in depth: Mesopotamia". Retrieved 31 March 2018. ^ Upinder Singh (2008). A History of Ancient and Early Medieval India: From the Stone Age. ISBN 9788131711200. Retrieved 31 March 2018. ^ Glenn Mullin. "Buddhism in Mongolia: Three or Five Waves of Cultural Blossoming". FPMT Center. Retrieved 31 March 2018. ^ Kort, Michael (2005). The Handbook Of East Asia. Lerner Publishing Group. p. 7. ISBN 978-0761326724. ^ Geoff Foy. "Confucius". Asia Society. Retrieved 21 April 2018. ^ Yingshi Yu, Shih-yu Yu (1967). "Trade and Expansion in Han China: A Study in the Structure of Sino-barbarian ..." Retrieved 21 April 2018. ^ "What is China's Mandate of Heaven?". Thought Co. Retrieved 21 April 2018. ^ Eisenman, Joshua; Heginbotham, Eric; Mitchell, Derek (2007). China and the Developing World: Beijing's Strategy for the Twenty-First Century. M.E. Sharpe. p. 9. ISBN 9780765624659. Retrieved 31 March 2018. ^ Walker 2012, p. 2. ^ "Japanese / Nihongo)". Omniglot. Retrieved 21 April 2018. ^ Chris Livaccari. "The Three Teachings". Asia Society. Retrieved 21 April 2018. ^ "Sanjiao: The Three Teachings". Columbia University. Retrieved 21 April 2018. ^ "East Asian arts - Common traditions". Encyclopedia Britannica. Retrieved 31 March 2018. ^ Grabowski, Richard; Self, Sharmistha; Shields, William (2012). Economic Development: A Regional, Institutional, and Historical Approach (2nd ed.). Routledge (published 25 September 2012). p. 59. ISBN 978-0765633538. ^ S. Robert Ramsey (1989). The Languages of China. Princeton University Press. ISBN 9780691014685. Retrieved 21 April 2018. ^ David R. Olson. "Chinese writing". Encyclopeadia Britannica. Retrieved 21 April 2018. ^ Karen Steffen Chung. "Some Returned Loans: Japanese Loanwords in Taiwan Mandarin" (PDF). National Taiwan University. Retrieved 21 April 2018. ^ Tanaka, Tan. (1992). "Early Japanese Horticultural Treatises and Pure Land Buddhist Style: Sakuteki and Its Background in Ancient Japan and China" in Garden History: Issues, Approaches, Methods (John Dixon Hunt, ed. ), p. 79. ^ Keith Weller Taylor (24 April 1991). The Birth of Vietnam. ISBN 9780520074170. Retrieved 21 April 2018. ^ "The long cultural strings of Water Puppetry". 14 August 2003. Archived from the original on 23 December 2008. Retrieved 21 April 2018. ^ "Heian period". Encyclopædia Britannica. Retrieved 21 April 2018. ^ "Haeinsa Temple Janggyeong Panjeon, the Depositories for the Tripitaka Koreana Woodblocks". UNESCO World Heritage Centre. Retrieved 22 April 2018. ^ "The Chinese Canon". BuddhaNet. Retrieved 22 April 2018. ^ Gi-Wook Shin (2006). Ethnic Nationalism in Korea: Genealogy, Politics, and Legacy. ISBN 9780804754088. Retrieved 21 April 2018. ^ Robert Kelly (3 June 2015). "Why South Korea is So Obsessed with Japan". RealClearDefense. Retrieved 21 April 2018. ^ John L. Brooke (17 March 2014). Climate Change and the Course of Global History: A Rough Journey. ISBN 9780521871648. Retrieved 21 April 2018. ^ Coningham & Young 2015, p. 27. ^ Mark McClish, Patrick Olivelle (7 September 2012). The Arthaśāstra: Selections from the Classic Indian Work on Statecraft. ISBN 9781603849036. Retrieved 21 April 2018. ^ Upinder Singh (2008). A History of Ancient and Early Medieval India: From the Stone Age to the ... ISBN 9788131711200. Retrieved 22 April 2018. ^ Michael Witzel. "The Development of the Vedic Canon and its Schools : The Social and Political Milieu" (PDF). Harvard University. Retrieved 22 April 2018. ^ "Hindu synthesis and smriti". Speaking Tree. Retrieved 22 April 2018. ^ "The Global Religious Landscape – Hinduism". A Report on the Size and Distribution of the World's Major Religious Groups as of 2010. Pew Research Foundation. Retrieved 21 April 2018. ^ Pew Research Center. "Global Religious Landscape: Buddhists". Pew Research Center. Retrieved 21 April 2018. ^ Pechilis, Karen; Raj, Selva J. (1 January 2013). South Asian Religions: Tradition and Today. Routledge. p. 193. ISBN 9780415448512. ^ "10 Countries With the Largest Muslim Populations, 2010 and 2050date=2015-04-02". Pew Research Center's Religion & Public Life Project. Retrieved 21 April 2018. ^ Diplomat, Akhilesh Pillalamarri, The. "How South Asia Will Save Global Islam". The Diplomat. Retrieved 21 April 2018. ^ Peter R. Blood. "Pakistan : a country study". Library of Congress. Retrieved 22 April 2018. ^ Bista, Dor Bahadur (1991). Fatalism and Development: Nepal's Struggle for Modernization - Dor Bahadur Bista - Google Books. ISBN 9788125001881. Retrieved 15 January 2018. ^ Mendis, V.L.B (1985). Foreign Relations of Sri Lanka: Earliest Times to 1965. Tisara Prakasakayo. pp. 113–16. ^ Sirisena, W. M. (1 January 1978). Sri Lanka and South-East Asia: Political, Religious and Cultural Relations ... - W. M. Sirisena - Google Books. ISBN 978-9004056602. Retrieved 15 January 2018. ^ Daigorō Chihara (1996). Hindu-Buddhist Architecture in Southeast Asia - Daigorō Chihara. ISBN 978-9004105126. Retrieved 30 April 2018. ^ Victor T. King (2008). The Sociology of Southeast Asia: Transformations in a Developing Region. ISBN 9788791114601. Retrieved 30 April 2018. ^ "Southeast Asia: Imagining the region" (PDF). Amitav Acharya. Retrieved 30 April 2018. ^ James Rennell (1831). "A treatise on the comparative geography of western Asia: accompanied with an". Retrieved 30 April 2018. ^ Jerry J. Sweeney, William R. Walter (1 December 1998). "Preliminary Definition of Geophysical Regions for the Middle East and North Africa" (PDF). Lawrence Livermore National Laboratory. Retrieved 30 April 2018. ^ "Steppe Nomads and Central Asia". web archive. Retrieved 1 May 2018. ^ "National Identity between Tradition and Reflexive Modernisation: The Contradictions of Central Asia". Academia edu. Retrieved 1 May 2018. ^ "West Asian architecture – Ancient Mesopotamian architecture". Quatr US. Retrieved 1 May 2018. ^ Ronald G. Knapp (5 July 2006). "Chinese Houses. The Architectural Heritage of a Nation". Cambridge University Press. Retrieved 1 May 2018. ^ Klaus-Peter Gast. "Full text of "Modern Traditions - Contemporary Architecture in India"". Archive Org. Retrieved 1 May 2018. ^ Reimar Schefold; P. Nas; Gaudenz Domenig, eds. (2004). Indonesian Houses: Tradition and Transformation in Vernacular Architecture. NUS Press. ISBN 9789971692926. ^ James T. Ulak. "Japanese architecture". Encyclopedia Britannica. Retrieved 1 May 2018. ^ Jan Henket, Hubert; Heynen, Hilde (2002). Back from utopia: the challenge of the modern movement. Rotterdam: 010 Publishers. ISBN 978-90-6450-483-9. ^ Marshall Cavendish (September 2007). World and Its Peoples: Eastern and Southern Asia, New York. ISBN 978-076-1476-31-3. ^ "Gods and Goddesses". Mesopotamia.co.uk. Retrieved 1 May 2018. ^ "WWest Asiatic Architecture". IntelliChristian. Retrieved 1 May 2018. ^ Cachia, P.J.E. (January 1960). "Modern Arabic Literature". University of Toronto Quarterly. 29 (2): 282–296. doi:10.3138/utq.29.2.282. ^ "Cultural Values of Asian Patients and Families – Dimensions of Culture". www.dimensionsofculture.com. Retrieved 15 November 2016. ^ "The Value and Meaning of the Korean Family". Asia Society. Retrieved 15 November 2016. ^ "Religious Diversity Index" (PDF). Pew Research Center. ^ a b c Houissa, Ali. "LibGuides: Exhibition: Islam in Asia: Diversity in Past and Present: Muslim Populations". guides.library.cornell.edu. Retrieved 21 January 2018. ^ Houissa, Ali. "LibGuides: Exhibition: Islam in Asia: Diversity in Past and Present: Islam in Southeast Asia". guides.library.cornell.edu. Retrieved 21 January 2018. ^ "Religion: Year In Review 2010 - Worldwide Adherents of All Religions". Encyclopedia Britannica. 20 November 2016. Retrieved 21 January 2018. ^ a b c d e "Christianity 2015: Religious Diversity and Personal Contact" (PDF). International Bulletin of Missionary Research. January 2015. ^ "Buddhists". Pew Research Center's Religion & Public Life Project. 18 December 2012. Retrieved 21 January 2018. ^ "Hindus". Pew Research Center's Religion & Public Life Project. 2 April 2015. Retrieved 21 January 2018. ^ "Jewish Population of the World". www.jewishvirtuallibrary.org. Retrieved 22 January 2018. ^ "World's Muslim Population Will Surpass Christians This Century, Pew Says". NPR.org. Retrieved 22 January 2018. ^ "Asia-Pacific". Pew Research Center's Religion & Public Life Project. 2 April 2015. Retrieved 22 January 2018. ^ "BBC - Religions - Jainism: Jainism at a glance". Retrieved 22 January 2018. ^ 2010 Chinese Spiritual Life Survey, Purdue University's Center on Religion and Chinese Society. Statistics published in: Katharina Wenzel-Teuber, David Strait. People's Republic of China: Religions and Churches Statistical Overview 2011 Archived 2016-03-03 at the Wayback Machine.. Religions & Christianity in Today's China, Vol. II, 2012, No. 3, pp. 29-54, ISSN 2192-9289. ^ Goodstein, Laurie (2008-09-06). "Zoroastrians Keep the Faith, and Keep Dwindling". The New York Times. Retrieved 2009-10-03. ^ "The Flavors of Asia". Quaker Oats Company. Retrieved 30 April 2018. "Cultural Values of Asian Patients and Families – Dimensions of Culture". Dimensionsofculture.com. Retrieved 15 January 2018. "The Value and Meaning of the Korean Family". Asia Society. 20 August 2008. Retrieved 15 January 2018. Asian cultural art and antique showcases the cultural ornaments used by the tribes in south east asia during ancient time.